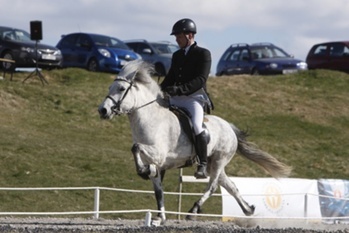 Promising daughter of Gnýr frá Árgerði (8.02) and Edda frá Egilsstaðabæ (8.00). Týr frá Heimahaga is very promising, the son of Gnýr frá Árgerði (8.02) and Gjöll frá Skíðbakka (8.24). 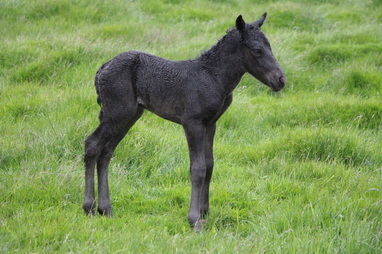 Týr was born in a pouring rain on the 30th of June. 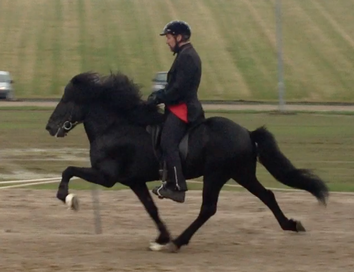 First price, high class competition five gaited mare with 8.53 for Riding Abilities; 8.5 for tölt, 9 for trot, 8.5 for pace, 7.5 for gallop, 9 for spirit, 8.5 for general impression and 8 for walk. Daughter of Kvistur frá Ólafsvöllum (8.26) and Gígja frá Skíðbakka III. In five gate Gjöll has received 6.47 in preliminaries and 7.02 in finals. In A-Class (five gate) Gjöll has received 8.63 in preliminaries. The first photos of Týr frá Heimahaga was taken on his date of birth, 30th of June, only 4 hours old.